The Bible is overflowing with stories of great people of faith who serve as examples of how we should live our lives. On the opposite ends of the spectrum, there are plenty of tales of those who worked to undermine and even try to destroy the work of God. While their lives are full of failures and misdeeds, we can still learn a lot from these people. 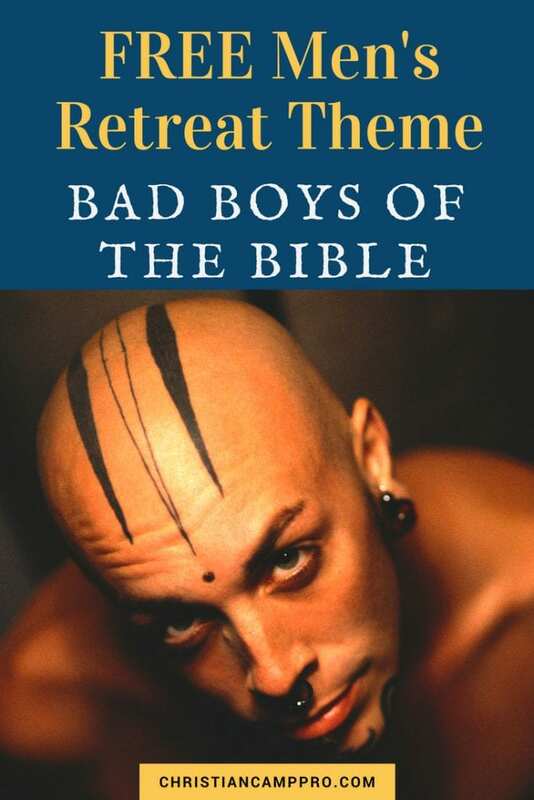 This men’s retreat theme looks at several “Bad Boys of the Bible” and the missteps they took that led them down a path of regret and ruin. 12 Abram lived in the land of Canaan, while Lot lived among the cities of the plain and pitched his tents near Sodom.13 Now the people of Sodom were wicked and were sinning greatly against the Lord. When it came time for Abram and his nephew Lot to separate, Lot chose to move to the fertile east plain of the Jordan river. He settled his family near a city that was infamous for its godlessness and wicked inhabitants. Despite this, we later see Lot living in the city. When God poured out his judgment on the evil city, Lot and his family narrowly escaped, but Lot lost his home, possessions and even his wife in Sodom. Use the story of Lot to remind men of the dangers of allowing sinful influences into their lives. It can seem inconsequential at first, but the cost is always more than we’d like to pay. 5 When Haman saw that Mordecai would not kneel down or pay him honor, he was enraged. 6 Yet having learned who Mordecai’s people were, he scorned the idea of killing only Mordecai. Instead, Haman looked for a way to destroy all Mordecai’s people, the Jews, throughout the whole kingdom of Xerxes. The nobleman Haman had everything his heart could desire: position, respect, wealth. But there was one thing that irked him. One person in the kingdom refused to bow to him, a Jew named Mordecai. Because of his pride and resentment, Haman sought to exterminate all the Jews. His wicked plot was uncovered and he was put to death for his foul deeds. Use the story of Haman to show men that pride does indeed go before a fall. Haman’s burning hatred and resentment toward one person almost led to the genocide of God’s people and cost Haman his life. Probably the most infamous person in the entire Bible, Judas was one of Jesus’ inner circle. He was loved and trusted enough to be put in charge of the group’s funds. However, Judas was greedy. Not content to simply pinch funds from the group’s purse for his personal use, Judas went straight to the chief priests and offered to bring them Jesus in exchange for money. Judas sold out his friend and teacher for thirty pieces of silver. While he ultimately had a change of heart, this act marked him throughout history as the worst kind of traitor. Use the story of Judas to remind men of the dangers of greed. Ambition is good, but it’s another thing entirely to sacrifice beliefs, morals and relationships in the pursuit of wealth. No, scrubs are not just for women. Even guys need some exfoliation from time to time. This scrub recipe combines two important elements from the story of Lot: charcoal and salt. Supply each guest with sea salt, activated charcoal powder, coconut or olive oil, fragrance (if desired) and a jar to put the finished product in. Mix all the ingredients together and put the scrub in the jar. The men can take it home to use or pass it along to the women in their lives. During the feast of Purim, the story of Esther is read aloud. By tradition, whenever Haman’s name is read, graggers are employed to make noise and drown out the hated name. Supply the necessary Lego pieces to each guest and let them follow the step-by-step instructions for creating their very own Purim gragger. Greed is bad, but this wallet craft is awesome. Supply each guest with his choice of colorful (or plain) duct tape. Help guests follow the instructions for making these cool, one-of-a-kind wallets. For this game, guests stand in the center of the room and dance or move about while music is played. When the music stops, they must freeze. Anyone caught moving after the music stops is out. The last one standing wins. Don’t end up on the gallows like Haman! Divide your group into teams and let them compete against each other to try to guess the word without getting hanged. This dice game has several variations, but the basic concept is the same: do whatever is necessary to score points and win the game. Send each guest home with a goody bag containing some tongue-in-cheek treats: Red hots for Lot, Lemon Sour Drops for Haman and Hershey Kisses for Judas. Make use of old pesky pennies with one of these fun craft ideas. The simple ideas are inexpensive and make for a great activity if you need a time filler. The stories of Lot, Haman and Judas are sad examples of men who took the wrong path and paid a great price. However, we can learn from their mistakes. A retreat focused on the lives of these men can show modern guys the importance of living lives dedicated to God and help them to avoid the mistakes that led to the downfall of men like Lot, Haman and Judas. Interested in a similar retreat theme for women? Check out these bad girls of the Bible.